Joel Watts: Lunatic, Liar, or Lord? I have to thank Manoj Joseph for pointing out some date/time oddities in Joel’s testimony concerning exactly when he emailed Neil about the DMCA takedown. With all the work I had to do to bring Vridar back to life, I barely had time to skim a handful of the relevant posts around the web. But now with the passage of couple of relatively peaceful days, I think it’s time to reflect on what happened. In particular, we should look more carefully at those screenshots that Joel so graciously provided. I just checked his site, and they’re still there, but just in case he catches on to his mistake, you will still be able to find them in various web caches. Comment posted at 12:43 AM local to Joel’s blog. That’s a curious little side note from Mr. Watts. The WordPress administrator tool in the screen capture shows a local time (EDT) of 12:43 AM. WordPress doesn’t show you the local time of the sender; that would be insane. No, this is Joel’s local time: Eastern Daylight Saving Time. So what’s this business about a “time difference“? Joel wants to prepare us for a little con job that he’s about to foist on us. It reminds me of short-change artists who confuse you with their nonsensical patter just before they coax you to give them an extra 20-dollar bill. Next, Joel kindly shows us an image capture of his desktop. Looking at his Sent Items folder, we’re led to believe that he sent an email to Neil at 12:56 PM on the 26th. So, Neil posted shortly after midnight (EDT) on the 26th. Joel allegedly sent his mail “shortly there after [sic]” — I guess 12 hours is a “short time” in Joel’s mind. No matter. It is, after all, the same calendar day. But hang on. Compare the wall clock time on Joel’s Macintosh to the time on the email. Remember: These are all local times of the sender. 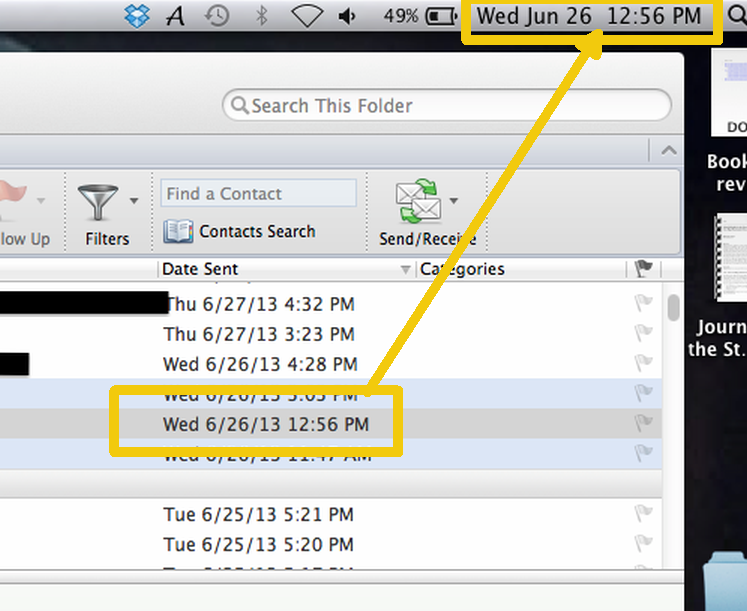 Outlook doesn’t show the local time of the recipient; that would be crazy.